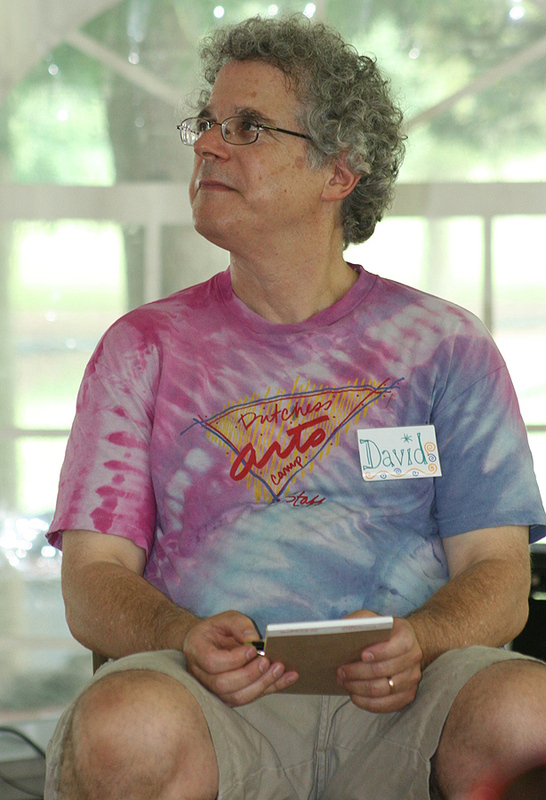 David Bloom: Retired teacher, former director of the Dutchess Arts Camp, and current member of The Art Effect’s Board and fundraising committee. On Thursday, Jan. 11, we invited volunteers, supporters, and donors to attend a sneak peek reception of our annual Teen Visions show — an exhibition of more than 60 paintings, drawings, and photographs created by participants in The Art Effect’s 2017 Art Institute Summer Intensive. More than thirty people came to this exclusive event. For a glimpse into what it was like, we’re pleased to share with you the experience of two of our longtime supporters: David Bloom and Roger Connor. It is hard to believe that twenty one years have gone by since Todd Poteet explained his vision for the Art Institute to Carole Wolf and me at a corner table in the Palace Diner. Todd’s vision for the Art Institute has come to fruition in every way! The January 11th Teen Visions Preview Show once again showcased the brilliant work and compelling teaching of the Art Institute. There was excitement in the air as our Executive Director Nicole Fenichel-Hewitt welcomed supporters, community leaders, and alumni to view the exhibit of sixty paintings, photographs and drawings. For long time supporters like myself, the Preview Show offered an opportunity to deepen our understanding and celebrate the excellence of the Art Institute. A pebble dropped into a glass of water at the diner in 1997 continues to send ripples across the country and beyond. To long time and new supporters, thank you for your support as we continue to grow. Roger Connor: Independent media producer, fundraising committee member, and longtime supporter of The Art Effect. I’m looking at the Teen Visions ‘18 exhibition and I am in awe. In this hand-painted collage of the American flag, the rubble of the Twin Towers and faces of 9/11 victims, there is the head and shoulders of a 1st responder. He has a big, chiseled jaw and hard eyes under a low brow. It is the image of a man who has lived a hard, physical life. Through the single line of his mouth, this man’s emotions come out to me. Though he carried the burden of a life of giving, there is a satisfaction and pride in his face. It fills me with pride, too. I’m proud of my cousins and uncles and friends who chose the same path in life. And I’m in awe that a teenager, just starting out in life, could capture such emotion with a paint brush – and transfer that emotion to me. That’s why I appreciate art. When a piece of art sets off a sudden burst of emotion in my brain – whether it’s pride or anger or sadness or love, I’m in appreciation, and awe, of the artist’s work and how it affects me. Art produced by young people will still have the rough edges of a student learning techniques and style, but the emotion evoked from their work can be truly awe inspiring. The Art Institute is currently accepting registrations to participate in this year’s Summer Art Intensive. For your chance to see your work showcased in next year’s “Teen Visions” in 2019, be sure to sign up now.